If you love a British accent (and who doesn’t? 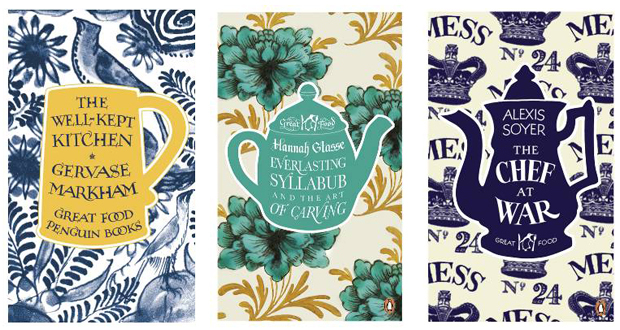 ), make yourself comfy and listen to the Guardian UK discuss Penguin Books’ gorgeous Great Food Series which features beautiful reprints of the best recipe books of the past 400 years. As the reporter says, reading them is like looking through a window into the kitchens and of cooks living during periods of war and periods of peace one hundred, two hundred and three hundred years ago. Authors range from Alexandre Dumas to Alice Waters and titles from Buffalo Cake and Indian Pudding to From Absinthe to Zest. I’d start with the Elizabeth David, just because I love her and haven’t read A Taste of the Sun. Curious? Visit Pen Vogler’s Great Food Club, where the Penguin Books editors blogs her way through the collection. Wouldn’t they make a beautiful gift for a foodie you love? Now I need to find me a UK friend willing to ship me a box or two. UPDATE: Penguin US will begin releasing copies here in October. Can’t wait!